Our range of water storage tanks are compliant with local water by-laws (WRAS approved) and come with drip trays, chlorination and an installation service provided by the Action Pumps team. Water storage tanks are available in a range of sizes produced from either fibreglass or galvanised steel. 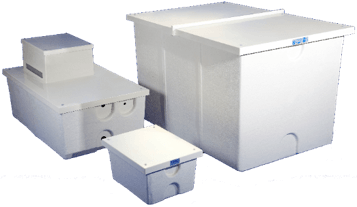 Fibreglass tanks are supplied as one-piece, two-piece or sectional options. The galvanised steel tanks are available in rectangular or cylindrical formats. Action Pumps expertise extends to being able to offer the right type of kiosk to house pumping equipment and controls. Available in steel or fibreglass and in a variety of colours and finishes – smooth, textured or simulated brick. All kiosks adhere to British Standards. Larger, walk-in versions can also be manufactured and supplied in fibreglass. Please browse our product and application pages to review our full product ranges, along with their predominant uses. If you do not see the product to suit your project, contact us directly on 023 9226 8511 or email [email protected], where a member of our technical team will assist you with your requirements. For any difficulties or questions you might have regarding our website, product and services please contact our Support team or fill out the contact form. Copyright © 2018 Action Pumps Ltd. All rights reserved.